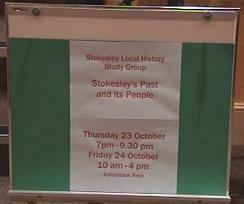 A dvd created by Charles Stuart documenting the Exhibition held by the Local History Study Group in 2003 to celebrate 150 years of Stokesley Town Hall. It contains information on all the display boards which include Religion, Houses, School photographs, Shops, Show & Fair, Pubs & Brewers - in fact everything that was given to the Study Group by people who have fond memories of Stokesley. Copies of the photographs were taken and are stored in Stokesley Library; the original photographs were returned to their owners. 84 pages with 27 illustrations & index of Stokesley surnames. For more details click here. 92 pages with 27 illustrations & index of Stokesley surnames. For more details click here. The original was a monthly magazine published in Stokesley by William Braithwaite from January 1843 to December 1845. Extracts of the news items have been transcribed by Beryl Turner covering Police Intelligence, Agriculture, Stokesley Races, Cricket Matches, Railways, Church and Chapel events, Inquests, Births, Marriages, Deaths, Visits to Redcar and many more snippets of gossip. The area covered is broadly Old Cleveland centered on Stokesley but also includes Stockton, Middlesbrough, south west to Northallerton, and across the North York Moors to Staithes on the east coast. It gives an insight into life in an agricultural community in the mid 1840s. In addition, a Name Index has been prepared which you can browse here as a Word document. Click here. The Repertory is also available as 36 separate files, one for each month. Click here. Over 4000 names of Gentry, Residents and Trades people in Stokesley taken from 19 directories between 1793 and 1901. They are listed by year and alphabetically by surname giving occupation and addresses; included are historical descriptions of the town in 1823, 1867 and 1901. The book has 215 pages and cost £10.50. It is now out of print, and available on this web site. Click here.